The data was added on ,	26 April 2018 read 318 times. Iran displayed two of its hi-tech reconnaissance drones, Yasir and Bina, in EURASIA 2018 Airshow in Antalya, Turkey. 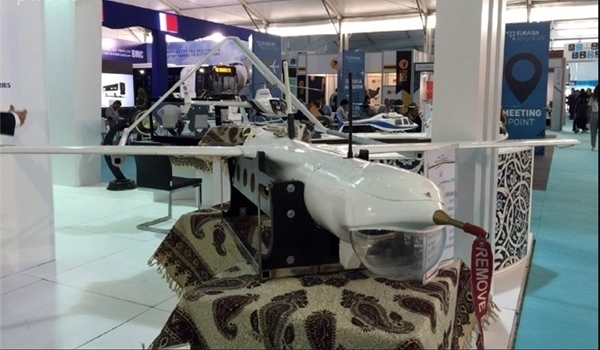 The two drones were displayed in the Iranian governmental institutions’ booth during the EURASIA 2018 airshow which is underway in Antalya from April 25 to 28. Iran announced in 2013 that its reconnaissance and combat drone, Yasir, enjoys a radar-evading capability and a 360-degree imaging system. “Yasir plane was designed for air reconnaissance operations given its dimensions, the type of its structure, body and the type of loads it carries,” Commander of the Iranian Ground Force’s Vali-e Asr Drone Group Colonel Reza Khaki told FNA at the time. Elaborating on the specifications of the drone, he said that Yasir can fly for 7 to 10 hours, do 360-degree imaging and take off from any place and land in any place; it enjoys a mobile portable system; its remote control system can be installed on a tripod or a vehicle to move from one place to another place; its Maximum Operating Altitude is between 11,000 to 15,000 feet; and is radar-evading due to its aerodynamic design, the special substances used in its body and its small dimensions. Yasir is an Iranian unlicensed copy of the American ScanEagle drone. Also, Bina is a silent drone developed by the Iranian experts which enjoys one-hour flight endurance and can fly for 10km at the 350-m altitude and 75-km speed. It was the first time that Iran displayed Bina in an international exhibition.